The Ensemble Materialtheater‘s approach to theatre is political, humourous, ironic and international. We love taking on the challenge of new artistic challenges, often cooperating with new partners. At the centre of things are the actors and puppeteers Sigrun Kilger and Annette Scheibler, together with director and also actor Alberto García Sánchez. Our productions are visually very rich, with unusual interpretations, astounding ideas and virtuoso acting. We play with objects (props), puppets, material and indeed with our own acting selves in ever changing ways. The Ensemble Materialtheater believes in modern, non-mainstream theatre for the people and has been rewarded with many prizes for this. Twice – in 2004 and 2012 – the city of Stuttgart awarded us with financial support for three years to support our conception processes. The federal state of Baden-Württemberg also did this in 2012. In 28 years of free theatrical work, more than thirty productions have been staged. These have been financially supported by, amongst others, by the Darstellende Künste e.V. (“performing arts foundation”), the FITZ! Centre for Puppet Theatre, Stuttgart, the State Theatre of Stuttgart, the Puppet Theatre in Halle, the Schaubude Berlin, the Festival Blickwechsel Magdeburg and the Festival La Strada in Graz. Several of our productions have been awarded prizes and we have been invited to take part in festivals in Europe, Africa and the USA. Born in 1959 in Barcelona. Graduate of the Ecole Internationale de Théâtre Lassaad in Brussels. Since 1996, Alberto has worked more and more as a theatrical director and author, initially with the Belgian theatre group Le Chien qui tousse and Michèle Nguyen. He met artists from Europe, Africa and America by being invited to major international theatrical festivals with his vibrant interpretation of Johan vom Po entdeckt Amerika ("Johan of the Po Discovers America") by Dario Fo (2002), resulting in productions in Switzerland, France, Canada, Spain and the Congo. In 2005 he was the theatrical director of an international project, Le Cadeau / Das Geschenk ("The Gift") with artists from the Congo, Germany and France, which premiered in Bochum at the FIDENA / RuhrTriennale. In 2010 he co-directed and staged the production of King Kongo for the Stuttgart based group, Gütesiegel Kultur. The first production took place at the FIDENA festival in 2010. 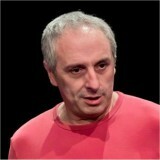 He has been working in close cooperation with the Ensemble Materialtheater as an actor and director since 1996, during which time he has been involved in productions of König Übü oder Mutter Übü braucht auch Geld ("King Ubu or Mother Ubu Needs Money Too"), Das Örtchen ("The Little Place"), Flöten und Töten ("The Flute Murders"), Hühnerkrimi "The Chicken Thriller"), Nacht des Gruselns ("Night of Horror"), Solaris, Bamba and Passion der Schafe ("Sheep Passion". He also spent more time writing stories and plays which have been put on stage by the Ensemble Materialtheater: Georg in der Garage ("George in the Garage") (2006), Ernesto Hase hat ein Loch in der Tasche ("Ernesto Rabbit Has a Hole in His Pocket" (2008), Drei Affen ("Three Monkeys") (2009), Der Garten ("The Garden" (2010), Laerm ("Noise") (2012), and Frauen lügen aus ihrem Leben ("Women's Lies") (2014). In 2011 he was awarded the prestigious French drama prize, Molière Jeune Public for the production of Vy. 2014 saw the premiere of his one-man production of Machintruc in France. Born 1967. Actor, puppeteer and director. Studied at the Staatliche Hochschule für Musik und Darstellende Kunst ("State University for Music and Performing Arts"), 1987 – 1992, specialising in puppet theatre. 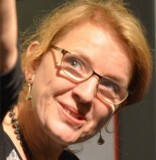 After the successful solo productions of Klodette kocht (" Klodette's Cooking"), Romeo & Juliet (winning, amongst other prizes, the Theaterpreis der Stuttgarter Zeitung), she then co-operated intensively with artists involved with international object theatre, for example the Italian Gyula Molnar in Blaubart ("Bluebeard"), Nachtwandler ("Sleepwalker"). She also worked with the Association Skappa! from Marseille with Magic 20th Century Tour and 10 Millionen km2 ("10 Million Square Kilometers"). From 2001 – 2003 she worked intensively with theatrical director Astrid Griesbach at the Theater des Lachens ("Comedy Theatre") in Berlin and at the Materialtheater Stuttgart in Lear – vor und nach Shakespeare ("Lear – Before and After Shakespeare") and Terror im Idyll ("Terror in Paradise"). She has been collaborating with the Ensemble Materialtheater since 2004. Born in 1963 in Ulm, Germany. Actor, puppeteer and theatrical director. She has also been lead singer and guitarist in the band Roszák since 1987. She learned how to act at the Staatliche Hochschule für Musik und Darstellende Kunst ("State University for Music and Performing Arts) in Stuttgart, specialising in puppeteering. In 1985 she founded the Materialtheater Stuttgart together with Hartmut Liebsch, achieving with this her breakthrough into the alternative theatre scene. She was then instrumental in many theatrical productions, working with many internationally famous artists, such as Miriam Goldschmidt, Christina and Franziska Rast, Alberto García Sánchez, Gyula Molnàr, Francesca Bettini, Katharina Wibmer and Stefanie Oberhoff. Several productions, for example Das Frühstücksmärchen ("The Breakfast Tale"), Paradise Now, Die Weißnäherin ("The White Dressmaker”), Die Schöne und das Biest ("Beauty and the Beast"), Hühnerkrimi ("The Chicken Triller”) and Flöten und Töten won prizes, one of these being the Stuttgarter Theaterpreis (Stuttgart Drama Prize) and has been invited to take part in international theater festivals in Europe, Africa and the USA. In 2004 Sigrun founded the Ensemble Materialtheater with Annette Scheibler and Alberto García Sánchez. This group produced Solaris, Bamba, Die Passion der Schafe (“Sheep Passion”), Der Garten ("The Garden"), Lärm ("Noise"), Drei Affen ("Three Monkeys"), Frauen lügen aus ihrem Leben ("Women Lies”), and Manipulation – eine unvollständige Collage ("Manipulation – an Imperfect Collage”). 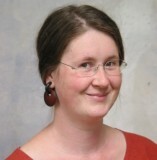 Sigrun has recently worked more in children's productions, for example in Georg in der Garage ("George in the Garage"), Ernesto Hase hat ein Loch in der Tasche ("Ernesto the Rabbit Has a Hole in His Pocket") and Das Mädchen im Löwenkäfig ("The Girl in the Lion's Cage"), plays which have now been performed in various languages all over Europe. Daniel plays the drums, vibraphone and percussion; he also composes music. Born in 1976 in Karansebesch / Banat in Rumania. He studied music at the Musikhochschule Stuttgart (Stuttgart Academy / University of Music), majoring in classical drums, graduating in jazz and popular music. Then followed numerous and varied concert work in all musical genres: the Christophorus Symphony Orchestra, the Junge Süddeutsche Philharmonie, WLB Esslingen, Junge Oper Stuttgart (youth opera), the Lukas Barockorchester (barock orchestra), the German Mozart Orchestra, the Neue Hofkapelle München, the Collegium Musicum Stuttgart, the Theater Rampe Stuttgart, the Staatstheater Stuttgart, the Stadttheater Ulm (shockheaded peter), and the Salzburg Festspiele production of Judith (2010). Further work includes co-writing and organising various events series in Stuttgart (T-Room: L`Egotrip) in the Rampe Theatre, danopticum in the Kiste Club. Daniel has written music and songs for various jazz and rock bands, including Bubenbad, Viermann and Soma, as well as for theatrical productions. He has worked in various bands, including Nikotrio (their first CD being Mandelsloh), Belaiza, Dieter Fischer, Ekkehard Rössle, Daniel Schnyder, Peter Schindler and Saltacello. He has worked since 2008 as musician, musical writer and actor with the Ensemble Materialtheater, in particular on Ernesto Hase hat ein Loch in der Tasche ("Ernesto Rabbit Has a Hole in His Pocket"), Drei Affen ("Three Monkeys", Laerm ("Noise"), Das Mädchen im Löwenkäfig ("The Girl in the Lion's cage") and Frauen lügen aus ihrem Leben ("Women's Lies"). Born in Ragusa, Italy. Studied stage design at the Academy of Arts in Rome and won a Diploma of Arts at the Scuola d’Arte in Comiso, Italy, as a professional photographer at the Scuola Electra in Turin. Photographic assistant to Claudio Abate and Vittorio Biffani, working on still life photography. Worked as a racing driver, restaurateur, photographer and antiques dealer in Rome, London and Paris. Stage technician in the Teatro Metastasio in Prato / Florence. Theatrical set designer for Scenoteck in Florence, for (amongst others) productions of Omage a Fellini with Caterina Valente, directed by Stelvio Cipriani in Milan and La Commedia della Seduzione, directed by Luca Ronconi in Prato in the opera Metastasio. Luigi has been working for about twenty years as an all-rounder for the Ensemble Materialtheater as set designer, props manager, lighting designer and photographer. In Drei Affen ("Three Monkeys") he was the "magic hand" under the stage.